Cardiothoracic surgeon Dr Himanshu Desai performing coronary artery bypass grafting. For almost a decade Dr Himanshu Desai has helped heal hearts in Western Sydney. 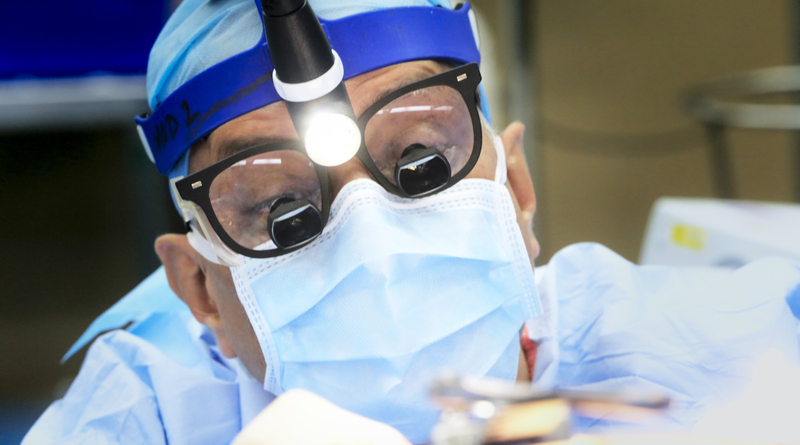 A leading cardiothoracic surgeon, Dr Desai is Westmead Hospital’s Visiting Medical Officer, with a distinguished career, which has taken him from the Sub-Continent, to North America and more recently, Australasia. Dividing his time between the public and private health sectors, Dr Desai performs up to seven heart operations every week. Recent developments in cardiothoracic surgery was discussed by Dr Himanshu Desai during Hospital Week. “Most recent developments in cardiac surgery centre around the mode of the access and the size of the incision,” he told The Pulse. Minimal access, or keyhole surgery, has become an alternative to the more invasive open-heart surgery. “The incision is getting smaller and smaller, like a keyhole operation,” he said. Dr Desai said while minimally invasive surgery provides surgeons with a greater challenge, it has major benefits for patients. These include less pain and discomfort for the patient and a quicker recovery. “It’s good for the patient from a cosmetic point of view and post-operative recovery point of view … but at the same time it makes the procedure more challenging and demanding on the surgeon’s side,” he said. It is meant that surgeons, rather than cutting through the breastbone, operate through a small incision in the right side of the chest, gaining access to organs via a path between the ribs. Of course, cardiothoracic surgeons deal with more than the heart. Any organ within the chest, in particular the lungs, fall under the expertise of these highly trained doctors. Dr Himanshu Desai preparing for surgery. Dr Desai initially trained in India, and became a cardiothoracic surgeon in 1987. After stints in the United States and New Zealand, he became a Fellow working at Westmead Hospital, and in 2010 commenced as the VMO at Westmead. Dr Desai told The Pulse he decided on his career at a very early age. “When I was in school, one day I thought I wanted to be a heart surgeon, and that became my ambition,” he said. Dr Desai’s interest in aortic surgery has helped drive the TAVI or TAVR method of replacing damaged heart valves at Westmead. It is another example of minimally invasive procedure for heart patients. Transcatheter Aortic Valve Implantation (or Valve Replacement) leaves the damaged valve in place while wedging in a new valve which expands within the damaged valve and functions like a new one. “It is deployed without opening the chest – we have been doing TAVI at Westmead Hospital for about one year – we must have done almost 10 to 15 cases by now,” he said. This cutting edge procedure is an example of how Westmead Hospital is providing the people of New South Wales with the latest in cardiothoracic surgery techniques. “It’s the most gratifying job, even though you put in a lot of hard work achieving it and continue pursuing it,” Dr Desai said. Dr Himanshu Desai performs up to seven heart operations every week.